While the turkeys roasted, potatoes were simmered, bread was sliced, stock was reduced, celery was chopped, onions were sauteed and eggs were devilled. I also got all up in a few packages of dry-cured English streaky bacon from Broadway Market. 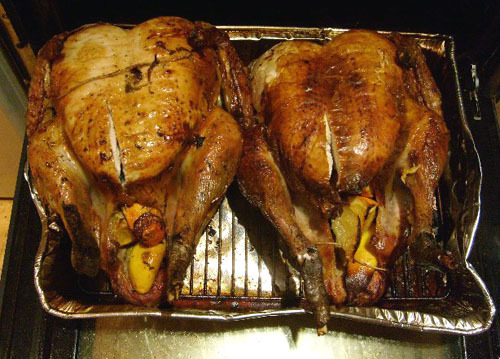 Irene and I have a Best Stuffing Ever recipe that we make in some variation every year. Now I know you probably think your stuffing is the Best Stuffing Ever, but our stuffing is actually the best, you just haven’t heard of it yet. Here’s why: it’s full of bacon. Not only will you find deliciously salty crunchy bits of bacon in every bite, but the entire stuffing is infused with amazingness because…all the vegetables are sauteed in bacon fat. 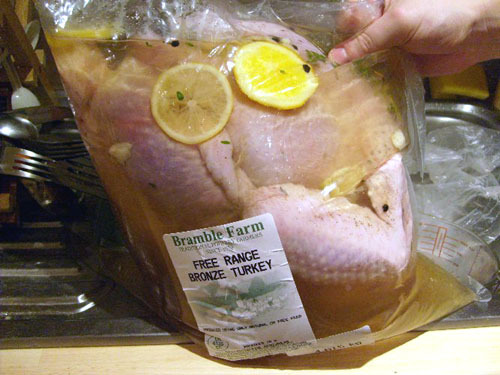 See, I told you it was the best stuffing ever. Bean and I started making this stuffing many years ago when planning an every-item-on-the-Thanksgiving-table-will-include-bacon meal. 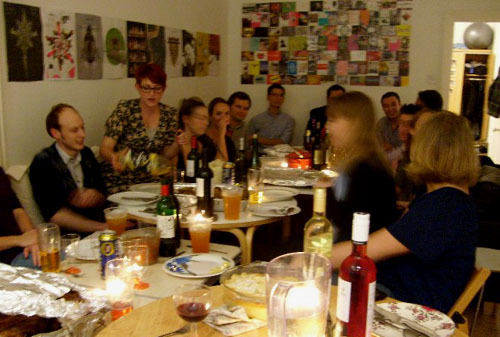 That started our traditional Thanksgiving kitchen takeover and probably helped develop our shared love for food and cooking and utter ridiculousness. So it’s all thanks to bacon, really. 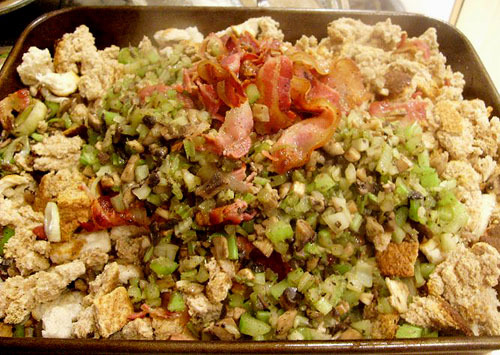 Above, you can see The Best Stuffing Ever: Deconstructed – a pile of bacon on a pile of mushrooms, leeks, and celery sauteed in bacon fat on a pile of sliced wheat and white bread. To make The Best Stuffing Ever yourself, use this recipe from Bon Appetit but keep in mind that it’s very forgiving of measurements and flavorings. You don’t really need seven cups of leeks – in fact you can leave them out altogether and the stuffing will be delicious. You also don’t need tarragon – you can use sage or rosemary or whatever you like. And that’s not even mentioning the 4539845 bottles of alcohol and, of course, dessert. Thanksgiving wouldn’t be Thanksgiving without an excessive amount of dessert. 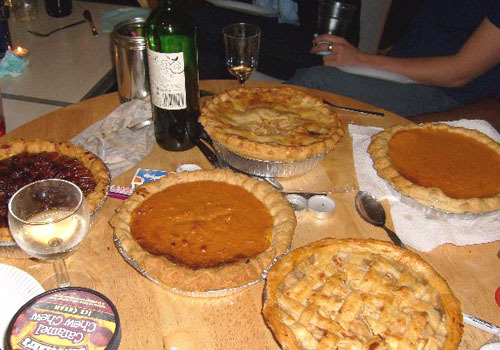 Accordingly, I made five pies. Because I firmly believe that you can never have too much pie. That includes two sweet potato pies (recipe here), because it’s hard to get real pumpkins here with a lot of flavor and I found out last minute that pumpkin in a can does not exist in London except as an American import. I got some funny looks in the supermarket. I also made two apple pies, one with a lattice crust and a little mini apple cutout. The butteriffic homemade pie crust recipe can be found here, which I liked because it did not request the use of a food processor or any other appliances I don’t own, only a sick amount of butter. 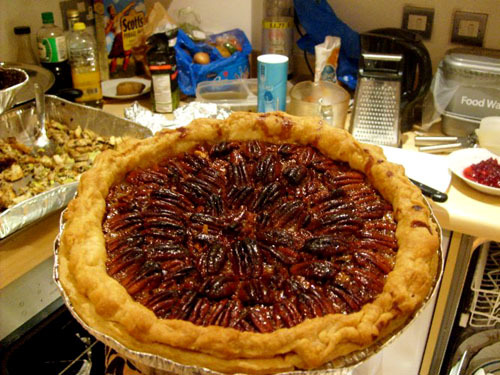 Here’s a picture of the pecan pie (recipe here), with a little bit of kitchen disaster in the background for good measure. 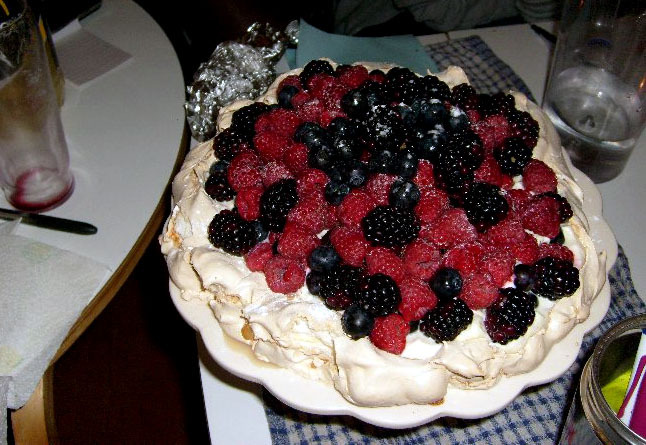 And our fabulous baker friend Lizzie brought over a stunningly gorgeous Pavlova topped with a mountain of fresh berries. To say we ate a lot of food is a bit of an understatement. Some people had seconds and then thirds and then several plates of dessert and could barely stagger out the door. But that’s what Thanksgiving is all about, right? We even played the ‘I’m Thankful For…’ game which you write down on a slip of paper and put it into a hat. Then you pick out an an answer to read anonymously and dramatically to the entire table, which resulted in some hilarious, happy and heartwarming moments. Maybe that’s what Thanksgiving is all about. But even with all the love and all the effort, the twenty-two wonderful people in the room couldn’t finish off the absolutely monstrous amount of food on the table. And I give thanks for that. Because then we had leftovers. And that’s really what Thanksgiving is all about. we should do this again. how’s saturday work for you? Oh yes, bacon in every dish is my kind of meal. That meal was so good. SOOOO GOOOOOD. I’m really really happy that you were the ones to break my Thanksgiving virginity. It’s funny to think that there was a time when I wasn’t obsessed with bacon. I guess it’s something I grew into… and if I keep it up I’ll continue growing into things, like bigger sizes of pants. Also, in case you missed my facebook status, here’s a word of the day. Kummerspeck (German): the weight gained from emotional over eating. Literally, grief bacon. My take on this is that all eating is emotional (cause it’s so exciting!) and it always makes you gain weight, and it very, very often includes real bacon (speck). So, I am 100% Kummerspeck. @chris: word. 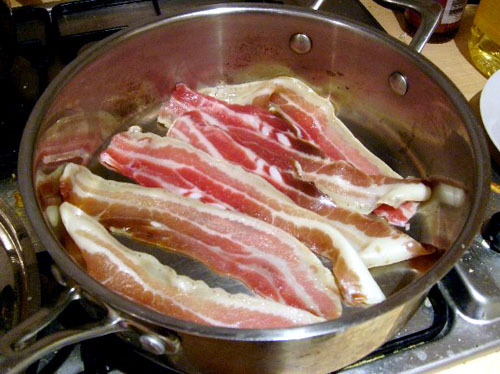 anytime you bring home the bacon (literally or figuratively), i will cook it. or spend it. 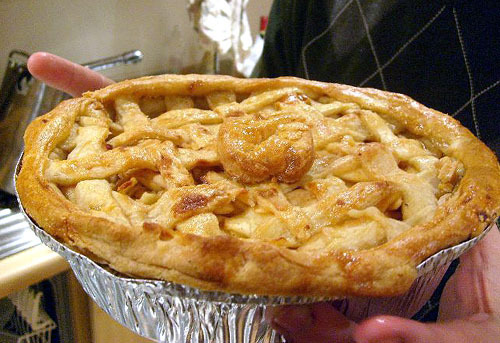 @molly: just added the recipe links, except the apple pie which i winged (wung? wang? this is making less and less sense) with apples, lemon juice and spices. love the idea of a ginormous thanksgiving next year. RAWWWWWWWRRRR. @irene: you are also 100%joybacon.